Banana and porridge is a super classic combo – and so it should be, it’s delicious! Its a breakfast staple that I make constantly as it’s nutritious, filling, quick and sets me up well for the day ahead. But recently, I have been getting a little bored… I fancied something new in the morning, something exciting, something….. CARAMEL. Yes, caramel for breakfast, that is what I needed. 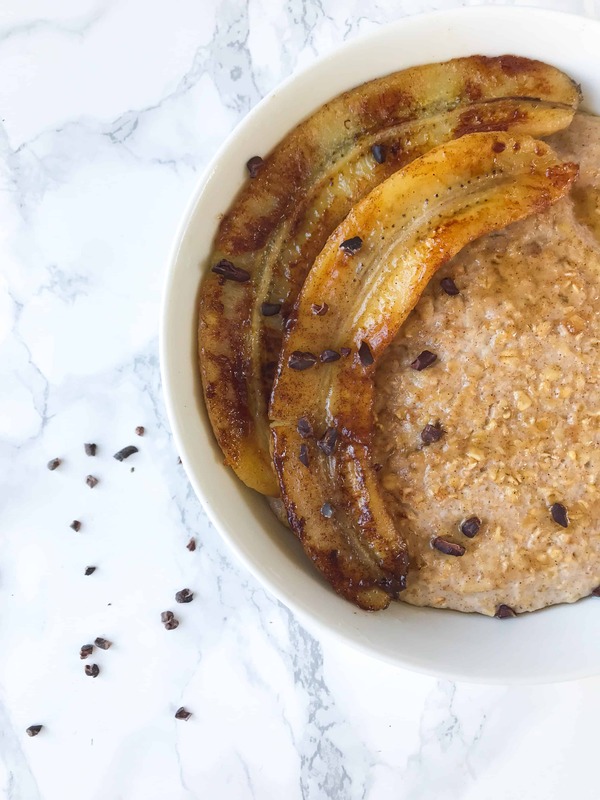 Caramelised banana porridge in fact – you can thank me later. Everyone has their own way to make porridge, whether it be with milk or water, on the stove or in the microwave, with rolled oats or instant oats – we all like it differently and I respect that. Its something individuals take years to master (so feel free to ignore step two of my recipe), but lets be real – plain porridge is BORING. Its really all about the toppings and I will bet you money that my caramelised bananas are the best thing to have ever graced your oats. 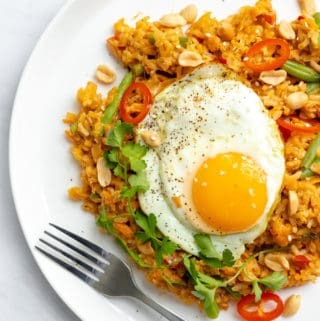 You may look at this recipe and think, erm Georgie, who on earth has time for this in the morning? Well, you do! Although this caramelised banana porridge might look super fancy, it actually really not. The bananas cook in the same length of time as the porridge, so, if you make porridge for breakfast anyway you really have no excuse not to make this. You also can probably find all these ingredients in your cupboards all ready waiting for you. Double no excuses. 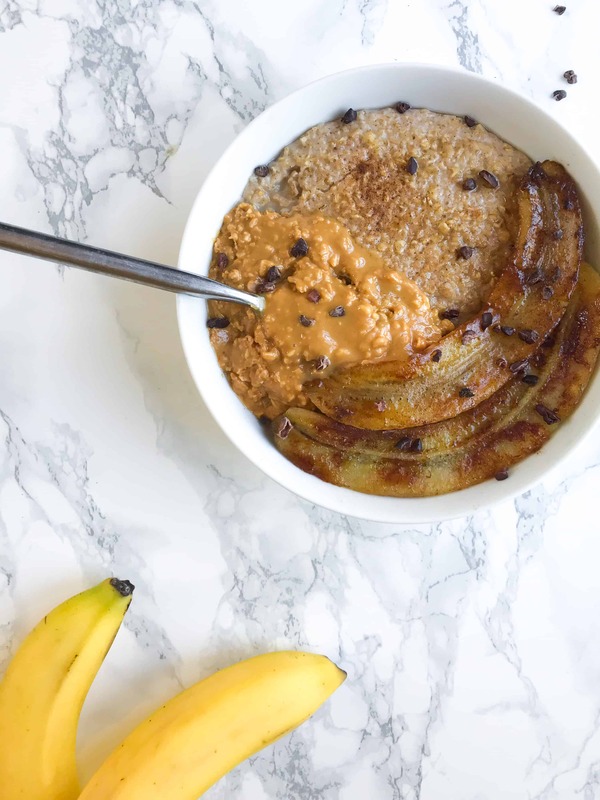 Although this caramelised banana porridge sounds wayyyy to decedent to be a breakfast recipe, it of course is healthy! Duh, this is Georgie Eats remember. 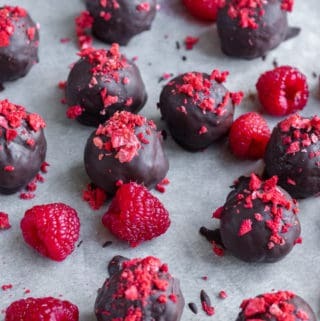 It contains no refined sugar, is vegan, gluten free, and super good for you. Oats are full of fibre, low in cholesterol and uber heart healthy! 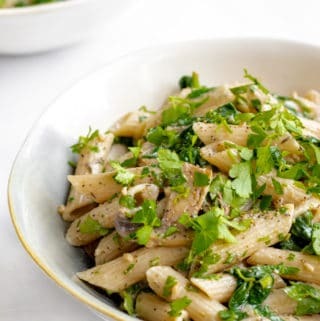 Pair that with a potassium rich banana and you have brilliant mix of slow release carbohydrates that will keep you going all the way through to lunch. I always like to give a few variations when I write a recipe to make it as easy as possible for everyone making it. If you haven’t yet jumped on the coconut oil train, you can make this with butter instead – it is just as tasty. If you aren’t keen on bananas then maybe just don’t make this recipe… JOKING you can use finely sliced apples. Just be aware that apples will need about double the amount of time to cook than the bananas. 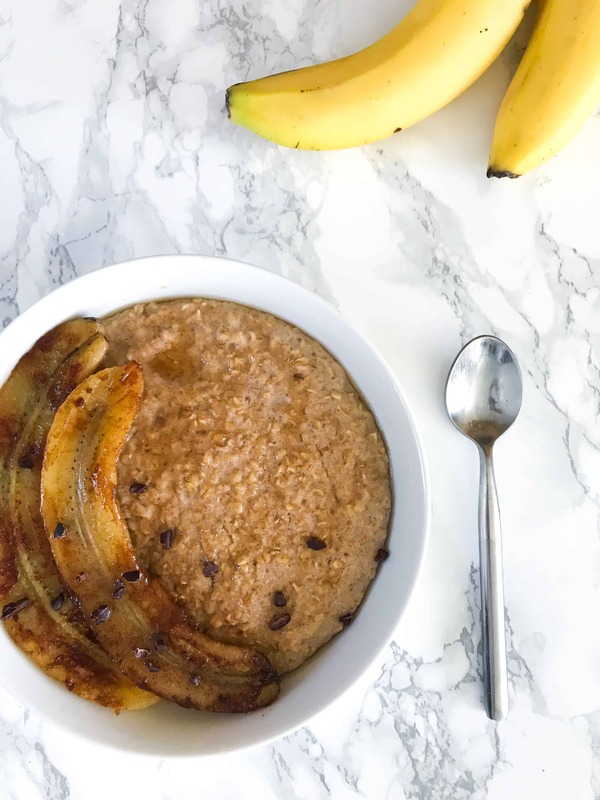 This blog post has taken me a number of days to finish as for some unknown reason I have found my caramelised banana porridge VERY hard to write about. I think I am suffering with writers block… so I am very sorry if this post doesn’t make any sense at all. You can just look at the pretty pictures. Oh yeah, this porridge was also VERY hard to photograph. I mean porridge isn’t the prettiest of foods now is it, but I did my best by topping it with peanut butter, because you CANNOT have banana without a little PB can you!? Oh, and some cacao nibs, because I’m fancy. This porridge has honestly made my mornings better. I wake up and think OMG I can have caramelised banana porridge for breakfast before basically leaping out of bed (no joke). So not only have I just invented the worlds best breakfast I’ve also discovered a new way to get yourself up. Please give this a go and let me know your opinion – I would love to hear from you! Leave me a message down below, or tag me in pictures on IG @georgieeatsblog. This caramelised banana porridge will make your mornings great again! Just as quick as your boring old plain porridge but one million times better! Vegan, gluten free, healthy and no refined sugar. Into a small frying pan over a medium heat, add the coconut oil, honey / maple syrup and vanilla. Stir until the coconut oil is melted and has combined with the sweetener. Add the banana and bring the pan to a simmer, turning the banana regularly to avoid it burning. Once the banana slices have turned golden brown, remove from the heat. While the banana is simmering add the porridge oats, nut milk / water and cinnamon into a medium saucepan over a medium heat. Stir the porridge constantly (the more you stir, the creamier your porridge will be) whilst bringing it to a boil. Reduce the heat and simmer for a few minutes until the porridge has reached your desired consistency. Remove from the heat. Pour the porridge into a large bowl and top with the banana, left over syrup from the frying pan, peanut butter and cacao nibs. 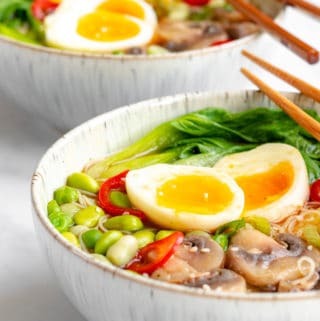 Enjoy whilst still piping hot served alongside a big cup of tea! Personally I like my porridge made with half almond milk and half water. Feel free to use whatever milk you prefer or even just water on its own! Apple instead of banana (cut the apple very thin and cook for longer). Butter instead of coconut oil. Quinoa flakes instead of porridge oats. You can use these caramelised bananas to top anything! 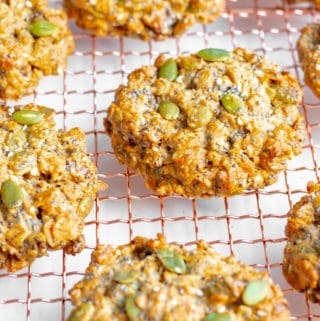 It is great with yogurt, granola or even a cheeky scoop of ice cream as a dessert. o my my my…look at the caramelised banana halves….I am seriously drooling, Georgie. Haha, yes you have to make it! iTS SO YUMMM!